Newly formed Edinburgh company Immerse Productions has put out an open call for amateur performers for its first show, Year Zero, at the 2018 Leith Festival in June. The site specific, immersive production will be staged in the Biscuit Factory and the company is looking for both stage managers and actors. 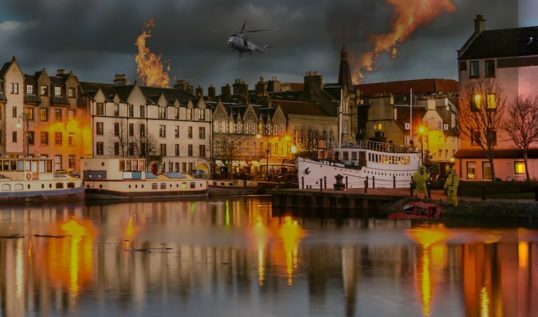 Leith is burning – but can you be saved in Immerse Productions’ pre-apocalyptic thriller? Using the latest technology in lighting, sound and special effects the company aims to transport its audience to a pre-apocalyptic world where confusion and panic is rife. According to its website: “An Immerse Production is different from a typical theatre show. Instead of watching from a distance you will be involved in the plot. Auditions for the production will be held in Edinburgh on Monday 14 May. Email hello@immerseproductions.org for details of time and place and to book an audition slot. Rehearsals will take place in the evenings of the week beginning June 4 with a tech/dress rehearsal on Monday June 11. The show will run in the evenings June 12 – 16. Email hello@immerseproductions.org for further details and to book an audition. Tuesday 12 – Saturday 16 June 2018. Evenings: 7pm; Two perfs Fri/Sat 16: 7pm & 8.30pm.